Part of the Nelson Bubble Lamp series, the Nelson Saucer Bubble Pendant’s wide surface area diffuses soft light into any interior. It comes with a ceiling plate, which allows it to delicately float overhead. George Nelson originally designed the Bubble Lamp series in 1952, inspired by a set of silk-covered Swedish hanging lamps. The Nelson Bubble Lamps are an assortment of lamps in various spherical silhouettes that emit an even quality of light. The wide shape of the Nelson Saucer Bubble Pendant, along with the gently flowing lines of its steel under-structure bring a lovely shape and soft light into any interior. 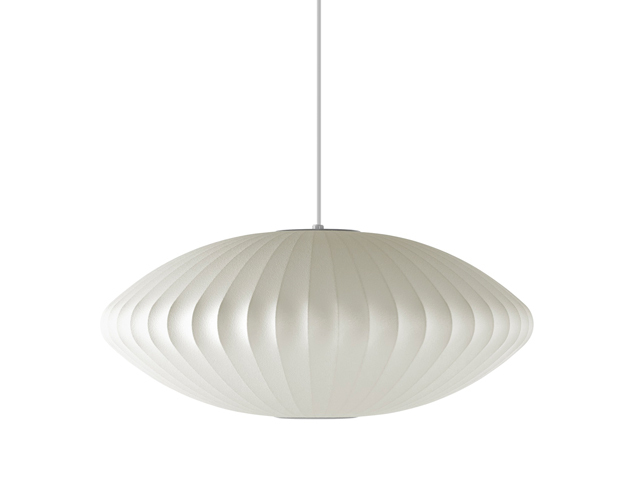 This pendant light is available in small, medium, large, and extra-large sizes. George Nelson first designed the series in 1952, when he came across a Swedish hanging lamp that he wanted to acquire for his office. He was challenged by the expensive price, which led to him making his own Bubble Lamp series. For use with up to 13 watt CFL bulb. Light bulb not included. For use with up to 32 watt CFL bulb. Light bulb not included.